Democratic U.S. Rep. Beto O’Rourke says Sen. Ted Cruz “has a tendency to mischaracterize a position” after the pair repeatedly traded barbs during a frosty first debate. Speaking to reporters at Dallas’ Southern Methodist University after Friday night’s debate, O’Rourke says that when he defends NFL players’ right to protest during the national anthem, Cruz likens it to endorsing burning of the U.S. flag. Cruz didn’t speak to the media except to say “I thought it went great” when asked about the debate. The pair will square off twice more before Election day as a race that once looked like a Cruz cakewalk tightens. 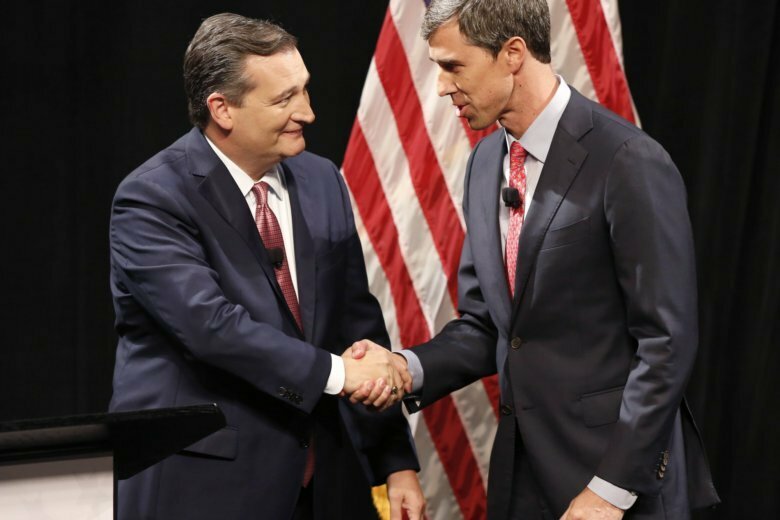 Republican Sen. Ted Cruz and Democratic Congressman Beto O’Rourke clashed over police shootings and gun rights in the first debate of their competitive Texas Senate race. Cruz on Friday night was also asked whether Supreme Court nominee Brett Kavanaugh’s accuser could say anything that might question his support. Cruz said “absolutely,” but didn’t elaborate while calling the allegations serious. O’Rourke, meanwhile, disputed reports that he tried to flee the scene of a 1998 drunken-driving arrest in El Paso. Cruz and O’Rourke are scheduled to debate two more times before Election Day. National attention in the race has grown as O’Rourke has raised more money than Cruz. And polls have suggested a tighter race than expected in a state where Republicans typically win in landslides. Republican Ted Cruz and Democrat Beto O’Rourke are holding their first debate as a Texas Senate race that once looked like it would be a cakewalk for the conservative incumbent now appears to be anything but one. Democrats have long dreamed of flipping heavily Hispanic Texas and transforming the national electoral map. O’Rourke is giving up his El Paso-based U.S. House seat to challenge Cruz. The Democrats haven’t won a Texas statewide office since 1994. An ex-punk rocker, O’Rourke has visited areas that Democrats long ago abandoned. A strong showing Friday night at Southern Methodist University would turn more heads. Cruz, a onetime Ivy League debate champion, finished second in the 2016 Republican presidential primary. But polls show that O’Rourke is staying close. President Donald Trump will rally in Texas for Cruz next month, which was once unthinkable in the nation’s largest red state.